When we first remodeled our kitchen, I had a whole slew of ideas on how I wanted to decorate it. I had boxes and boxes of decorations that I'd collected over the course of my marriage, and I couldn't wait to get them up and around our new space. Then I had my baby. And, he pushed all ideas of decorating right to the back burner. Where, quite frankly, they belonged - as I adjusted to life with him as part of our family. But, this past week, I finally did something I've wanted to do since the first time I crawled out of the back seat of our realtor's car, walked hand in hand with my husband into what would become our home, and saw the kitchen. 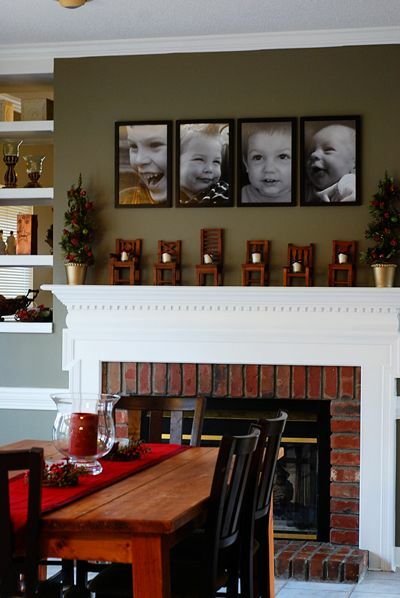 I hung their photos above the fireplace. 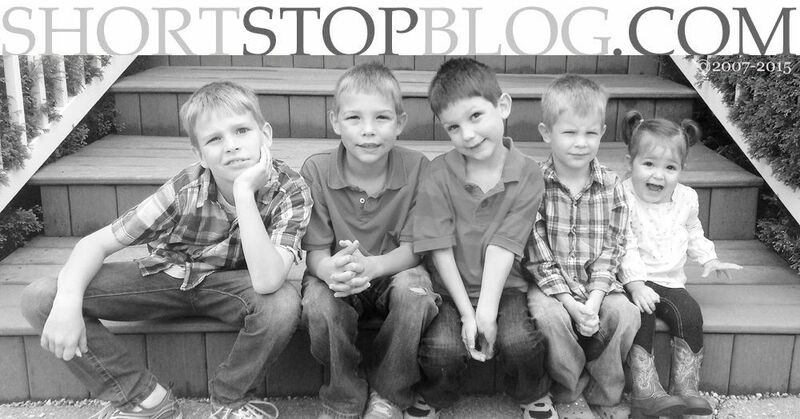 Photos that I, their Momma, took of each of them in moments when their expressions captured the spirit of who they are. When I look up, I see their faces. The beautiful, sweet-cheeked gifts that make everything I do - absolutely, positively, exhaustingly - worth it. this is stunning! i love the photos - it looks like you captured their personalities perfectly! I love you, Sarah Shortstop.... for the way you build your home into a beautiful place... emotionally and physically. It looks amazing. I am calling Pottery Barn and telling them to hire you. PS- You have inspired my lazy derriere to hop up sometime this week and add some Christmas decor to the house. Been kinda busy lately, but it would be a nice touch. I love your kitchen/dining area...it's beautifully and warmly decorated. I want to come live at your house! Sarah, I think this is a sign that you are "home". 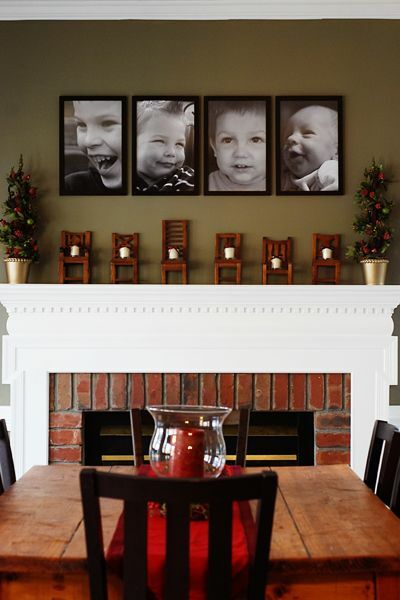 I often wondered why you had no pictures of the kids hung here in Michigan...I think you just needed to find "home" to make a home for those faces. Beautiful and you will treasure them forever!!! So wish I could stop over and just see you and the boys. You did a great job! The photos are great! Amazing! You really know how to make a house a home. I don't have any children (yet), but we do have a photo collage from our wedding in our living room and it always makes me smile. Pictures of family remind me why I'm here. It's perfect!! I love it! I LOVE this!!! So pretty and so YOU! 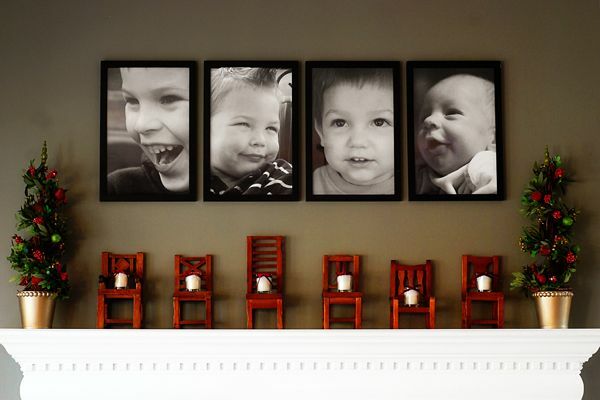 When they are throwing tantrums on the floor, you can always look up and remember the SWEET faces of the boys you love. Pictures ARE my decorations in my home! Love your boys pics! Btw, rec'd my Starbuck coupon today - can't wait to try some - THANKS! Oh those pictures are precious - just like your boys. You have a beautiful home. what size photos did you use sarah? it looks great and i love the little chairs and the votives on them. so sweet! I LOVE those photos!! The mantle looks wonderful. You definitely have a knack for decorating and a great eye for photography (of course you have some great subjects too). 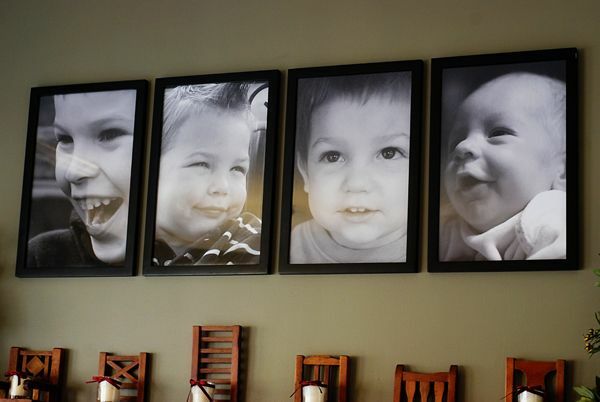 i LOVE these.... they fit perfectly there and definitely capture your boys. @3weemonkeys - They're 11" x 17". Sarah, you write above somewhere about how crafty you are not. These pictures show it is just not true. You have beautifully crafted your home. Where oh where oh where oh where oh where did you get those thing chairs!?!?!?!?!?!?!?!? 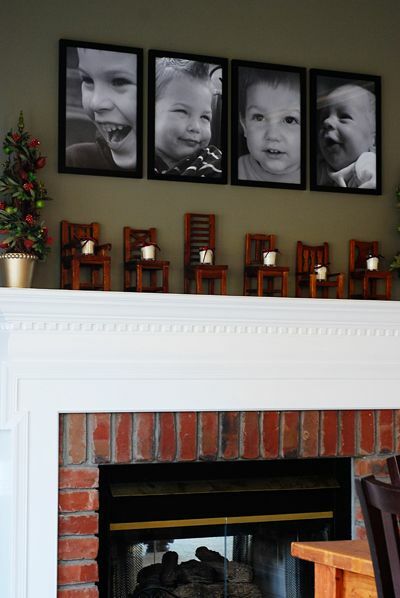 i did something similar above our fireplace with a huge canvas (i only have 1 baby, so he's the focus of our entire house) centered above 4 smaller pictures of him in the moment. it's my favorite space in the whole house. those photos of your babies are gorgeous though! absolutely stunning. but i MUST know where you got those tiny chairs from! I was wondering if you could tell me the paint color on your wall above the fireplace. I love it.